For over two weeks this month, the museums of the Smithsonian Institution, the National Gallery of Art, and other national memorials, parks, and zoos closed their doors and locked their gates because the United States Congress shut down the federal government. And since June, Kevyn Orr, the emergency manager of Detroit, has threatened to sell works from the collection of the encyclopedic Detroit Institute of Arts—to the tune of $2.5 billion—to help eliminate the city’s $18 to $20 billion debt. In August Orr hired appraisers from the auction house Christie’s to assess a better value of the collection; a final report is due any day now. The sixteen-day hardship recently endured by Americans and the government dysfunction in Detroit pale in comparison to the wretched situation in Belgrade. The National Museum of Serbia, with its rich collection of European art and medieval artifacts, has been closed for fourteen years, the artist Saša Tkačenko told a small group that gathered for a salon at the International Studio and Curatorial Program (ISCP) in Brooklyn. And the Museum of Contemporary Art in the capital city has been shuttered for six years. How could such a thing happen? Both institutions were closed for renovation, but after a year or two the projects were abandoned because of a lack of funds. That Serbian politicians can so grossly and irresponsibly ignore its cultural institutions boggles the mind, especially for Americans who hold European nations up to such high standards for their support of the arts. Tkačenko discussed three recent projects aimed at the closures. The first work, Fence (2012), is a mirror and steel construction, over two meters tall and six meters long, whose form corresponds to the Museum of Contemporary Art’s jagged architectural profile. The signature modernist building, designed in 1960 by the Yugoslavian architects Ivan Antić and Ivanka Raspopović and opening five years later, is not in ruins but has been all but abandoned. According to the New York Times, the administrative offices were moved offsite, with parts of the permanent collection shuffled to three small galleries spread across Belgrade. The former director told BBC News that she blames political elites who “do not have any interest in arts and culture. And even if they had, those interests don’t win political points or votes at elections. Politics is a men’s game—they would always rather fund sport.” Tkačenko said some curators still have their jobs and organize exhibitions elsewhere in Europe. Fence was part of an exhibition that took place on a riverbank opposite the museum, creating a dialogue between it and the empty building while also reflecting its viewers’ image back onto themselves, implicating them in the predicament. The curators, however, failed to obtain the proper permit to show the work—it was situated outdoors—and police forced a dismantling. “If that’s how they feel about contemporary art,” Tkačenko demurred, the museum “will be closed for a long, long time.” The museum even bought Fence for its permanent collection, but who knows when anyone will see it again. Tkačenko had the chance to show Fence again during a summer 2012 exhibition called What’s Happening with the Museum of Contemporary Art? that was held in the museum’s galleries. 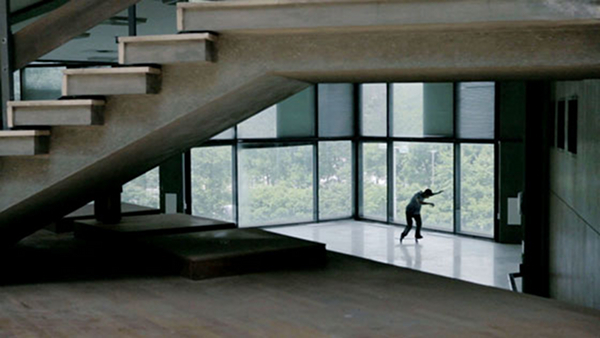 While the building was open he created Perfect Ride (2012), a five-minute video that juxtaposes stylized shots of the stunning interiors with footage of a lone male skateboarder cruising through the empty galleries doing ollies, kickflips, and shove-its. Tkačenko contrasted the pleasing sounds—to me, at least— of rolling polyurethane wheels and sharp snapping laminated plywood on the concrete floor with an abrasive soundtrack of droning noise, which annoyed me at first but then grudgingly made sense considering the prolonged irritation Serbian artists must feel toward government leaders that have continuously demonstrated that culture is not worth supporting. Considering the exhibition happened at all means there is still institutional sympathy, but not from those who matter most: the budget planners. 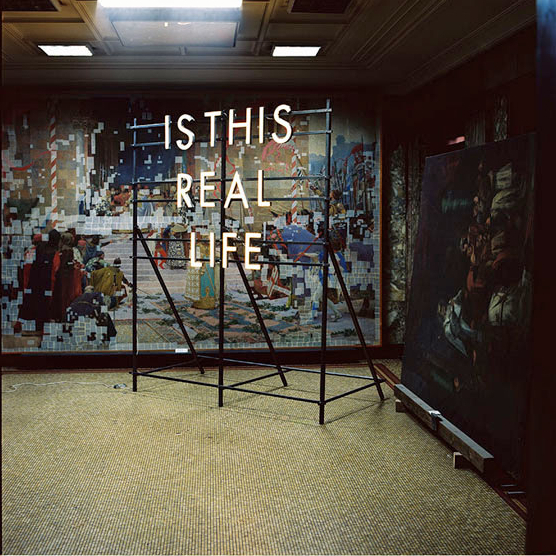 A third work, Is This Real Life (2013), challenged the National Museum’s closure. Tkačenko said he didn’t intend to do so many museum pieces, but he obviously did not pass up the opportunity to make another bold critique. In a gallery off the museum’s foyer—you can see one old-master-type work on its side—he built a metal structure that held Plexiglas letters, lit by LED lights, that asked—or stated, since there is no punctuation—“IS THIS REAL LIFE”. Next he invited five Belgrade photographers to document the work, giving no instructions other than making sure the words were visible. The resulting five images, whose subject was treated differently by each collaborator, are what remain of the work—the sculpture, seen in situ by only a few, will not be shown again. You can’t compare museum closings in Washington, DC, or the Detroit situation with Eastern Europe, Tkačenko said in response to an audience member’s question, because Balkan nations have socialist roots. But doesn’t that make the predicament in Belgrade even worse? The art market in that part of the world is almost nonexistent, he said, which would make government-financed institutions all the more important. What’s unique in Belgrade, he resigned, is that the museums close and nobody cares. The ISCP Salon’s second speaker, Henrjeta Mece, an Albanian artist and curator based in Toronto, addresses crises of historical and current events in more poetic but no less direct ways. Her work Means of Provision: Tirana–Piramida (2011) documents the famous pyramid building in Tirana, the capital of Albania, which was built as a museum for the Communist dictator Enver Hoxha in 1988. After the People’s Republic of Albania dissolved, the building became an important meeting place for the student movement. During the 1990s the pyramid became a youth center, hosting concerts, exhibitions and discos. The site even served as the home of a television station. Mece visited the pyramid two years ago, after the ruling party had the decorative white marble stripped from the sloping exterior. Some believe this was done to encourage vandalism on the crumbling building in a push for more support to raze the structure to make way for a new parliament house to be constructed there. For her work, which took seven days to complete, she stretched a long roll of Mylar on the slope and traced the surface with graphite. “Every line, dent, and stain has a history,” Mece said. 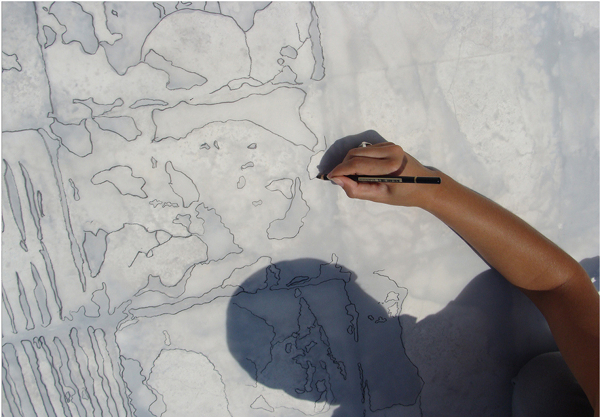 Though the drawing—which measures more than twelve feet long and three feet high—is abstract, it creates a phrenology of a politically charged geographic site, documenting a monument that for her speaks to the masses, not to the history books. A more recent work, Looking into the Future (2013), explores the intersection of politics and social space through Tirana’s coffee culture and its fascination with tasseography—a fortune teller’s reading of coffee grounds at the bottom of a cup. Coffee houses in the Albanian capital are social hubs where people drink four to five cups a day. The opposition party won the elections earlier this year, which made citizens anxious. Whenever a new group comes into power in Albania, Mece explained, all the government jobs change, from top posts down to the janitor. She began reading coffeehouse customers’ grounds to help them foresee their future. Even though Mece admitted having only a cursory knowledge of the practice—and that her subjects should not take her readings seriously—she discovered they were highly superstitious and therefore began to give only positive prophesies. 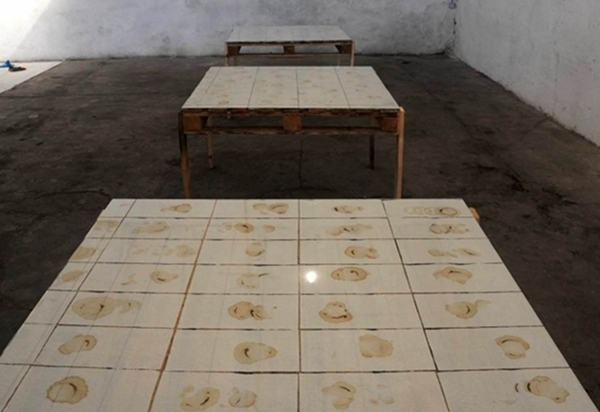 She completed about 340 readings and exhibited the stained tissues that she placed underneath the overturned cups—abstract mud spots of thick Turkish coffee—on repurposed shipping pallets that served as tables at the alternative art space Tirana Ekspres, where Mece was in residence this year. After her talk, Mece gave complimentary coffee-cup readings for a handful of ISCP Salon attendees, myself included. My future, Mece predicted, involves three upcoming trips—how did she know?—that will have both satisfactory and (potentially) piddling outcomes. 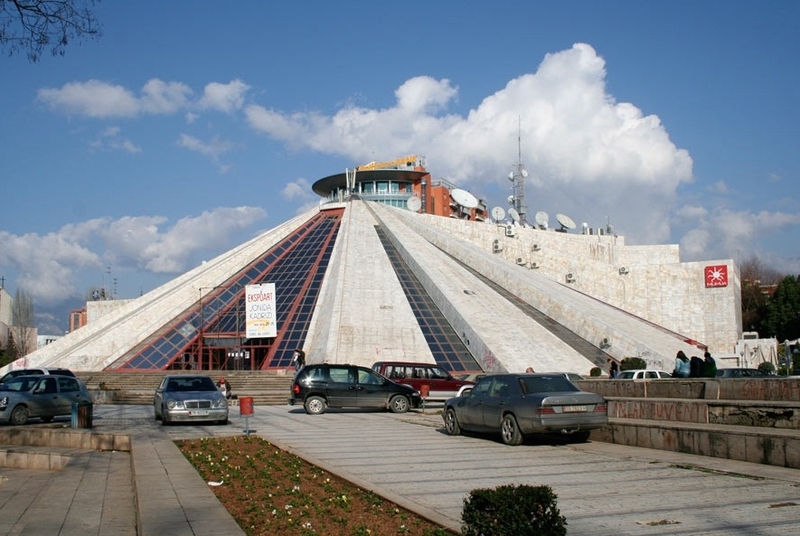 Let’s hope the situations with the two museums in Belgrade and the pyramid in Tirana fare much better than I do. Full disclosure: Last month I visited Henrjeta Mece and Saša Tkačenko in their ISCP studio through an invitation from their sponsoring institution, the Foundation for a Civil Society, a nonprofit organization based in New York.